Cell Counting Kit-8 (CCK-8) is designed to detect cell proliferation and cell toxicity based on WST-8 is reduced by dehydrogenases in cells to give an orange colored product (formazan). 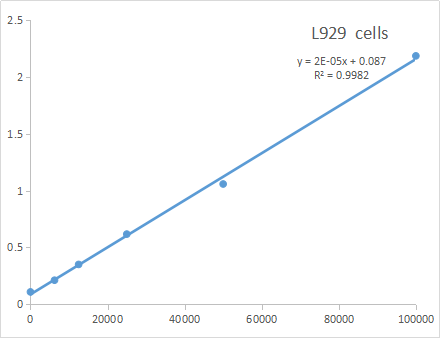 The amount of the formazan in cells is directly proportional to the number of living cells. Tests confirm that performance equals or exceeds popular CCK-8 kit from other suppliers. Fig. 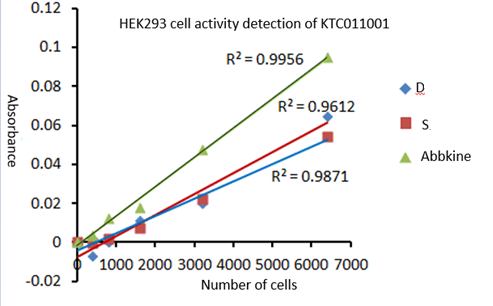 Abbkine Cell Counting Kit-8 (CCK-8) is designed to detect cell proliferation and cell toxicity. • One-bottle, ready-to-use solution. • The product (formazan) produced by WST-8 is water soluble, No organic solvents or isotopes required. And the formazan is stable and safe. • The detection sensitivity using CCK-8 is higher than assays using other tetrazolium salts such as MTT, XTT, MTS or WST-1. • The same cells can be used for other cell assays because of the low toxicity of CCK-8. CCK-8 is stable over one year at 0-5°C with protection from light. Store it at -20°C for longer storage. Repeated thawing and freezing causes an increase in the background, which interferes with the assay. Please store the kit at 0-5°C for frequent use. • Since the CCK-8 assay is based on the dehydrogenase activity detection in viable cells, conditions or chemicals that affect dehydrogenase activity in viable cells may cause discrepancy between the actual viable cell number and the cell number determined using the CCK-8 assay. • Be careful not to introduce bubbles to the wells, since they interfere with the O.D. reading. • The incubation time varies by the type and number of cells in a well. Generally, leukocytes give weak coloration, thus a long incubation time (up to 4 hours) or a large number of cells (~105 cells/well) may be necessary. • If the color or PH of culture media is changed due to long-time culture, please change the culture media when adding CCK-8. Cell Counting Kit-8 (CCK-8) utilizes highly water-soluble tetrazolium salt WST-8:[2-(2-methoxy-4-nitrophenyl)-3-(4-nitrophenyl)-5-(2,4-disulfophenyl)-2H-tetrazolium, monosodium salt] changed to a water-soluble orange formazan dye by reduction. CCK-8 is low toxicity and allows sensitive colorimetric assays for the determination of the number of viable cells in cell proliferation and cytotoxicity assays. The amount of the formazan dye generated by dehydrogenases in cells is directly proportional to the number of living cells.